The Triangle’s (Raleigh-Durham-Chapel Hill) Food Trucks news related to business happenings, events, and other whatever food trucks, fans, and those interested want to know. As reported earlier, we had an inkling Sweet Traditions by LeAne was going to open a brick and mortar location. However, things got quiet and Sweetness Warriors were afraid of disappointment (well, if not, this one here was getting paranoid). Happily, late last week LeAne made the announcement that an agreement has been signed and forward progress was underway. Clues were given about the location, but I was able to find more information. It was the old Quizno’s at 12516 Capital Blvd, which looks like the cross roads of Wake Union Church Road and Capital Blvd. The Shopping Center is Wake Forest Crossing and has anchor tenants of Lowe’s Foods, Kohl’s and CiCi’s Pizza. Also, released the “by LeAne” has been dropped from the brand (just Sweet Traditions) and a new website launches September 15th. I’m psyched about the website launch as I believe Stacey (@cookeatlife) was involved in some of the photography. Two predictions I have for Sweet Traditions,: 1) if Wake Forest shows their support like the did at the rodeo… Google Maps’ Traffic filter will be red surrounding the location. 2) Lowe’s Foods and surrounding bakeries will take a dip in sales. Congrats to LeAne, Roland, and their family on taking this big step. I’m not sure what the next rank after Captain is, but Captain Poncho’s earned it by announcing their plans to open a brick and mortar in Southern Village in Chapel Hill. I’m not as familiar with Chapel Hill as other areas in the Triangle, so I can’t pinpoint the address/old tenant. Keep posted as we find more information. Looks like Friday is not the only day for Breakfast Rodeos, the RTP offices famous for the Fidelity Friday rodeos is the new location for Thursday rodeos. Right now, the First Thursday is the set frequency, but if popular the organizers have expressed increasing the frequency to every other week (or more?!) 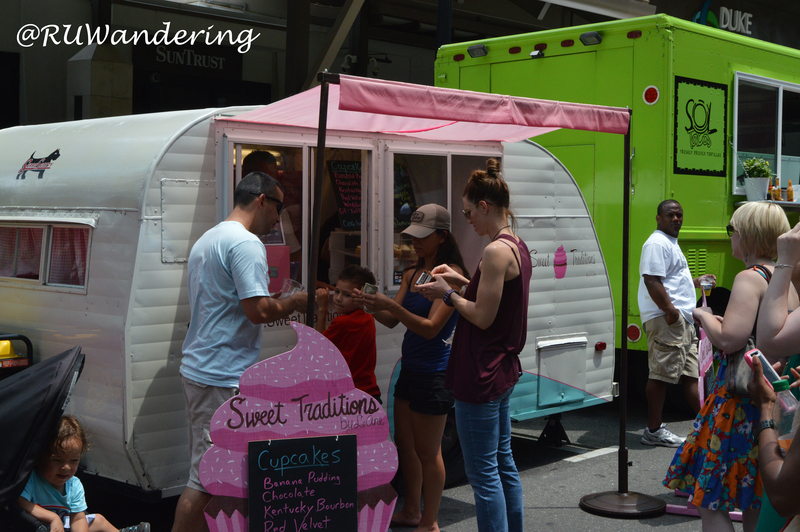 Same trucks as the Breakfast Rodeo: Wicked Biscuit, Belgian Waffology, and Caffe Bellezza. Also, coffee fans may want to show up for this as Carrboro Coffee will do a live roasting demonstration. The Rodeo location is 800 Park Offices (On NC 54 between T.W. Alexander and Davis Drive). True to its Italian theme, Caffe Bellezza released some speciality cocktails with Italian namesakes. 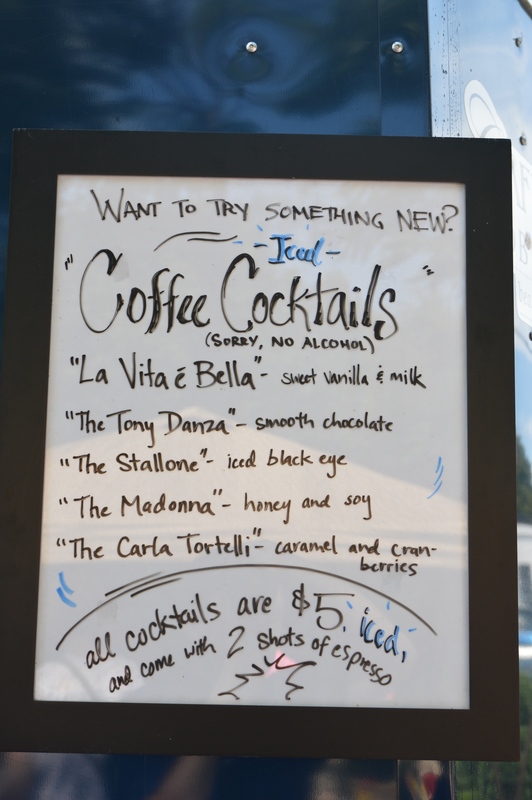 For instance, for what many know as a “Black Eye”, Caffe Bellezza has titled it “The Stallone” (after Rocky, get it). You can see some of the others, which I’ve already tried a few over the last few days. A changing of the guard occurred as Deli-icous is at Duke’s Campus Tuesday nights and Dump Pho King Truck will be the Run Club truck for a few months. September 2nd is also First Tuesday, so you want to double your miles for a Not Just Icing cupcake as they will be there, too. The premiere experimental and underground music festival in America comes to Downtown Raleigh September 4th-6th, Downtown Raleigh. Here are some events revolving around Hopscotch with food trucks involved. If yours is not on this list, contact me below. The music line-up has been up for days, but it looks some of the food truck events associated are being revealed. The first event I saw is called Babes in Boyland. The event sounds really cool and has a lot of things going on. The trucks announced are Chirba Chirba, Pie Pushers, and The Parlour. There are other vendors involved, but food enthusiasts will notice the Ashely Christensen Bloody Mary Bar and Cold Press Slingshot coffee. Also to note is proceeds from the event will go to Girls Rock NC. The Raleigh Little Theatre is having a party with Gussy’s Greek Truck and Raleigh Brewing Company. The event is free to the public, but they are asking to RSVP (please RSVP, it helps with crowd control). For more details, see the Facebook Page. Are you a Big Lebowski fan? Saturday at the North Carolina Museum of Art is the Second Annual event, where American Meltdown, Not Just Icing, and Stuft will be in attendance. The event is a ticketed event, so you may want to grab in advance. Details can be found here. September 7th, Waypoint Church in Durham will launch their first public service at 4pm. The line-up announced was Halal Bros, Hanu, and Not Just Icing. Double Barley is a brewery out in Smithfield that is having a food truck rodeo and craft fair. Food trucks, 20 artists, and live music will be there from 2-6 pm on September 20th. Food Truck line-up announced: Deli-icious, Virgil’s, Chick-N-Que, Olio and Aceto, and Ladybug’s Treats. Update: Follow them on Twitter (@Beericana) as I’ve seen tweets where tickets are being given away at breweries and events. Daily I am catching updates for this event, which looks like the planning stages are coming into full swing. I won’t go into full details on the beer, but I did notice beers outside of the Triangle are participating (like Old Mecklenburg in Charlotte). Food Trucks announced: Stuft, Tailgater Toby, Not Just Icing, Jam Ice Cream, All American, KoKyu, Dump Pho King, Valentino’s, Baguettaboutit, Olio and Aceto, and CJ’s Steet Food. Music includes Dark Water Rising, Lynda & Pattie, Skinny Bag of Sugar, and The Honeycutters as music. The event is September 27th at Sugg Farm in Holly Springs. Tickets Sales have also started with General Admission at $45, VIP at $75, and a Designated Driver at $15 (no beer access). For Tickets and more details, see the event site. 9/27/14 Breweries. Food trucks. Music. Mark your calendars! This week Sōl Tacos announced that November 5th will be their Beer Dinner with Deep River Brewing in Clayton. The menu will highlight Sōl Tacos’ Southern-influenced Latin theme with Deep River’s Fall Seasonal line-up. Tickets and such have not been announced, but you may want to lock this one down in your social calendar. 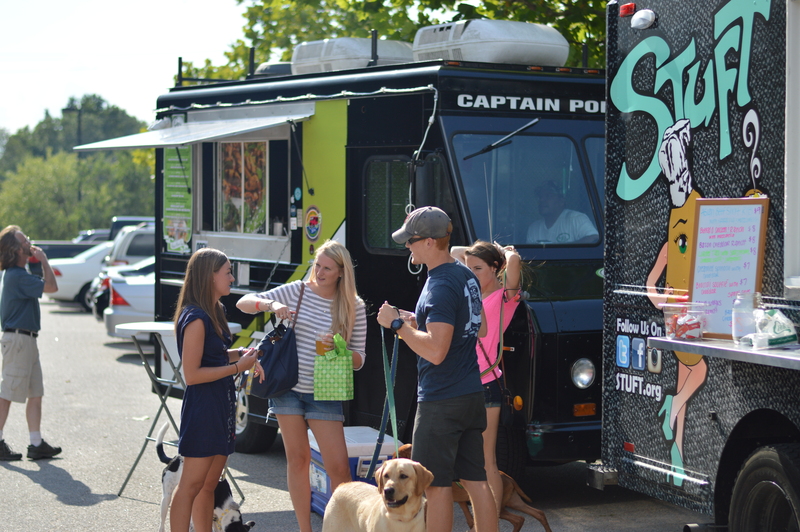 And the rumors are true, a food truck rodeo is coming back to Wake Forest. The line-up has not been announced, but the location is the same spot at the Over The Falls Center on Elm and Brooks in Wake Forest. The date has been set for November 9th. Check out more details on their Facebook Page here. This event has been around, but this year was my first time. For beer (and spirits as local TOPO Distillery was here this year) and food truck fans, this is a prime event. Two stages on both ends of Fayetteville Street with beer and food trucks filling the asphalt in between. The date set is April 25, 2015 and is from 2-10pm. I know a bit early, but you might want to circle it and tell your family this is a great weekend to visit. This Latin-Asian fusion truck has been hitting the asphalt tires screeching. Last week, they were a last minute surprise at Big Boss’ Run Club, spotted at Shop Local Raleigh’s Glenwood South Concert Series, and Railhawks games. If you haven’t seen them, follow the truck @AmigosanFood and check out their schedule at Amigosanfood.com. Bam Pow Chow has been hitting the streets, too and making appearances in the Northwest Raleigh. They have been spotted at House of Hops, Lonerider, Gizmo Brewworks, and Person Street Bar. Their website has posted a few scheduled events bampowchow.com and you can also follow the truck @BamPowChow. Last week, Clouds Brewing (126 N West Street, Raleigh) was mentioned opening August 29th. The open occurred however as I assumed, its a craft brew restaurant. So, cross this off as a regular food truck spot. Nickelpoint Brewing (506 Pershing Road, Raleigh) was rumored to be opening this weekend, however, based on recent updates it could happen. Based on my sources, they have been asking food trucks if they were interested in setting up there. House of Hops (6909 Glenwood Ave #100, Raleigh): This spot has been very hot with activity. Baguettaboutit. Kocina, and Bam Pow Chow were all spotted here over the last two weeks. The craft beer shop is located near Glenwood and Millbrook/Duraleigh (behind the Walgreens), which means a nice Northwest Raleigh food truck spot. Person Street Bar (805 N Person St, Raleigh): I always like it when a bar/brewery and food truck can come together. Both can come in with their specialities and exceed on expectations on both ends. So far, Bam Pow Chow, Dump Pho King Truck, Hanu, Green Olive Deli Truck, Not Just Icing, and Will and Pops parked here. Beer Durham (404 Hunt Street, Durham): Again, beer and food trucks collaborating! This neighborhood bottle shop has 20 beers on tap where you can refill growlers and now enjoy food trucks. I spoke with Ashley at the location and they are excited to have trucks be there. The location is in a multi-story mixed building a block away from Durham Central Park. I’ve seen Bo’s Kitchen, Porchtta, Sol Tacos and The Wicked Biscuit here with Bam Pow Chow listed the upcoming week. Marathon Gas Station, Five Points (1641 Glenwood Ave) on Fridays from 5-10pm the as close to Philly as you can get Philly Cheesesteaks food truck will be parked here. 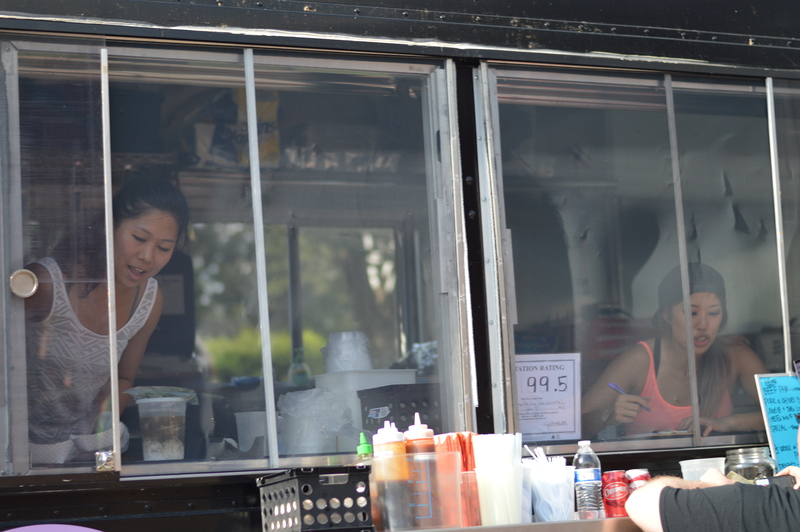 Greenway Club has frequently had food trucks on Thursday, Friday, and Saturday. Plantation Point Farmers Market: There is a new farmers market in North Raleigh, located at 6250 Plantation Center Dr (I-540 and Capital Blvd, next to BJ’s/Big Lots/Petco) that is food truck friendly. 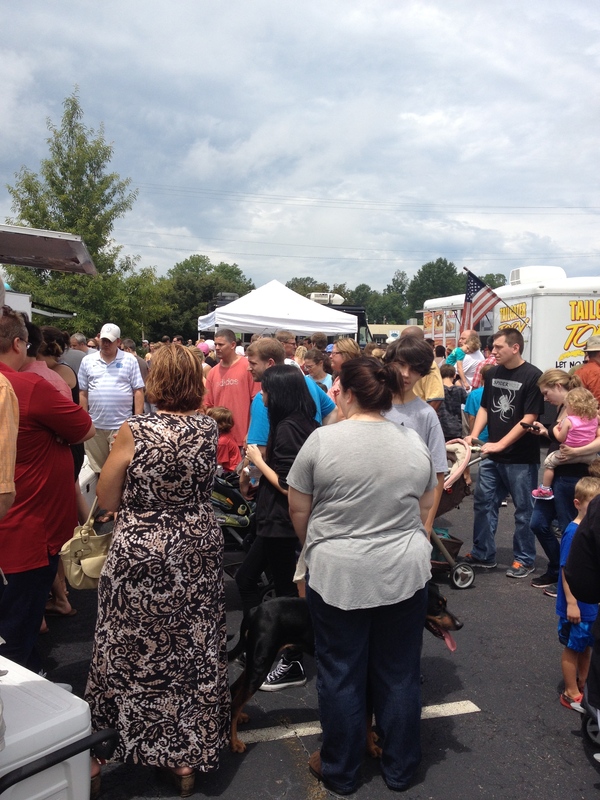 The organizers’ goal is to have two trucks, one entree and one dessert, and running the market year-round. If you are interested, feel free to contact me and I’ll get you in contact with the organizer. 400 S. Elliott Road (Chapel Hill). Note new Cafe Twitter handle: @OlioAcetoCafe. If you got news, let RUWandering know. 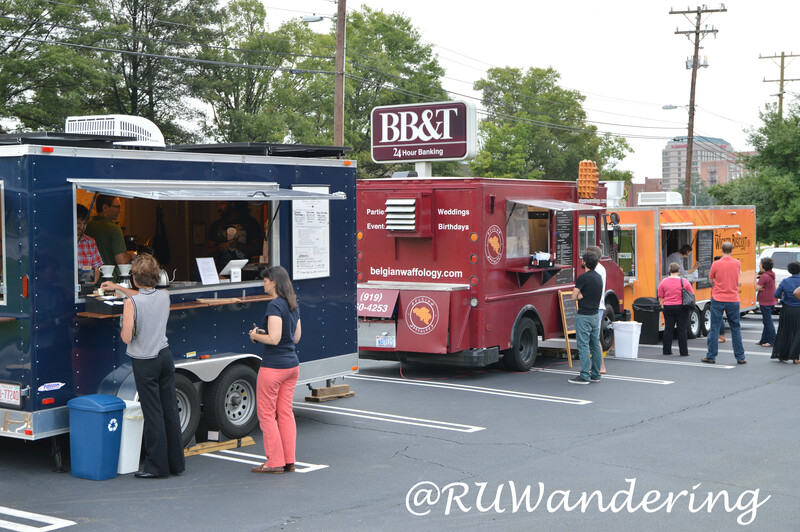 This is a weekly post summarizing food truck information in the Triangle area. Thanks for commenting! Southern Village is a great spot. Annually it is the spot for the TerraVita tasting event and sometimes I’ve seen food truck rodeos here, too.